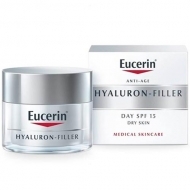 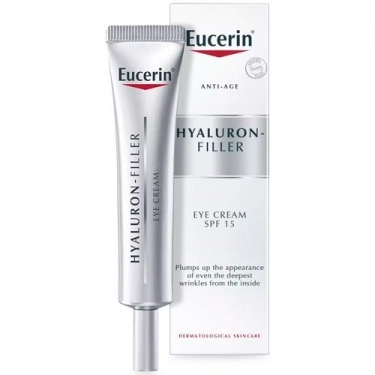 DESCRIPTION: Hyaluron-Filler Eye Cream from Eucerin is a cream that helps fight wrinkles while protecting against the sun's rays. 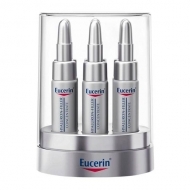 The formula, with a combination of Hyaluronic Acid with low and high molecular concentration, acts on existing and emerging wrinkles, and also contains bioactive Saponin Glycine. 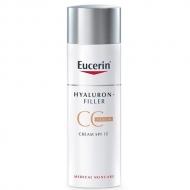 SPF15 and UVA protection effectively prevent premature aging and deepening of wrinkles in the eye area to make the skin smoother and younger. 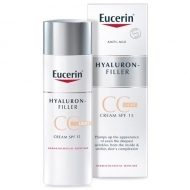 Apply to the area around the eyes and massage gently with your fingertips.